See how Versiv saves you time and money! Sign up for a demonstration with no purchase or payment necessary! Just click on the links below and fill out the form, for the product you’re most interested in. A Fluke Networks representative will call to schedule a demonstration. That’s it! TaptiveTM user interface simplifies set up, and eliminates errors. Request a DSX-8000 CableAnalyzer™ Demo Today! Future-ready VersivTM design supports copper certification to Category 8, fiber loss and inspection. SmartLoop™ OTDR technology tests two fibers in a single test eliminating the need to travel to the far end of the connection to perform tests. Multiple wavelengths support a variety of applications: 850, 1300, 1310, 1490, 1550, 1625 nm. Splitter detection for automated discovery of splitters. Up to 3 cascaded splitters may be found or manually configured. 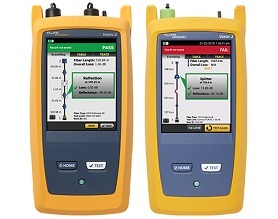 Request an OptiFiber™ Pro OTDR Demo Today! Future-ready design supports copper certification to Category 8, OTDR testing and inspection. 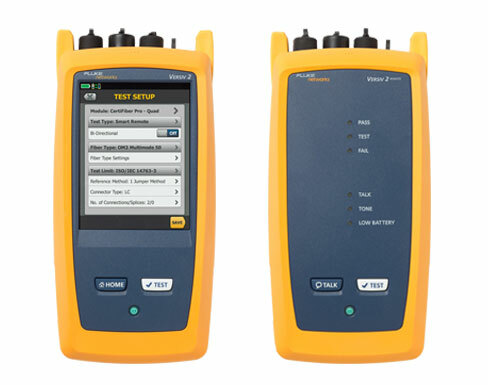 Request a Certifiber™ Pro Optical Loss Test Set Demo Today!